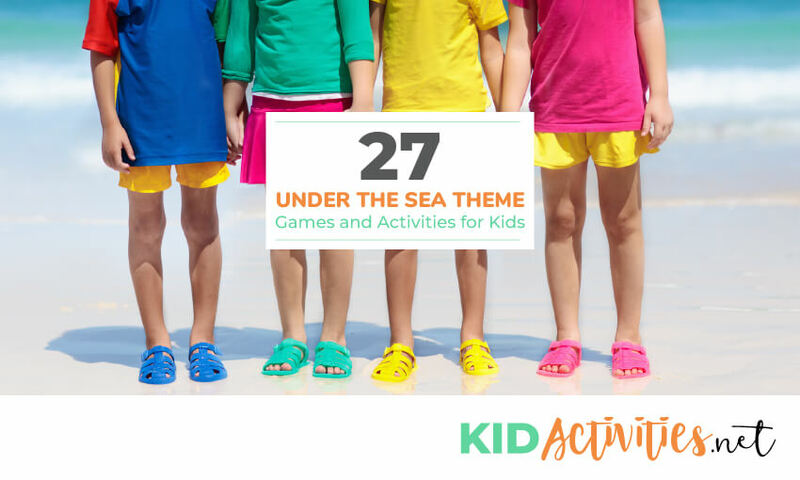 These simple ocean themed activities are sure to lead to hours of laughter and fun. What kid doesn’t enjoy the beach? If you cannot take a trip to the beach, bring the beach to the kids. 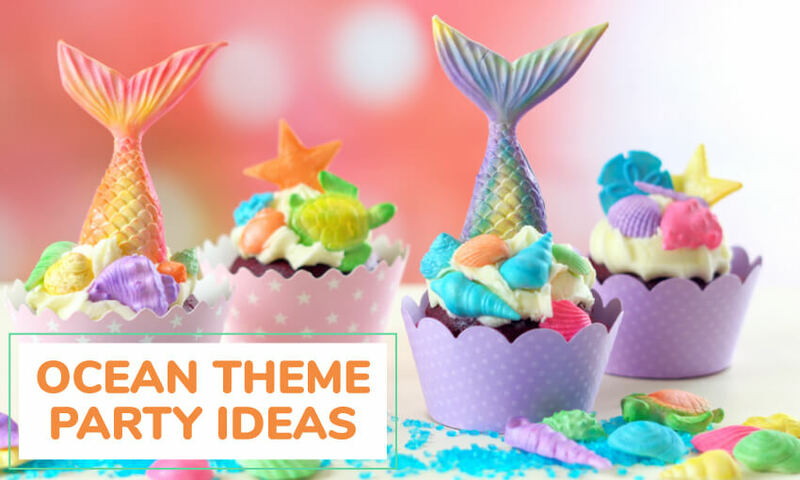 These under the sea theme ideas will make them feel like they are enjoying a summers day at the ocean. “Ocean Treasure”–add coins and beads! Either use colored paper plates or paint them. If painted (the plates in the image are painted) use the less expensive plates without the coated surface. The coated plates will take much longer to dry. Cut a ‘V-shaped” wedge from one side of the plate. This is the mouth. Glue that cut shape to the other side of the plate–this is the tail. Glue or draw on an eye…and decorate as desired. Sequins or other embellishments can be applied as disired. Although it doesn’t show in the image—the two fish pictured have glitter glue applied. Cut a paper plate in half. (This sample used small sized plates for the jellyfish) Paint the paper halves. When dry glue crepe paper “tentacles’. Put a cup of shredded newspaper into a blender. Put PULP into ‘OCEAN THEMED’ cookie cutters as molds. Use a straw to form a hole at the top. When completely dry, remove from form. Paint as desired and add string/yarn/cord/ribbon for necklaces (or oranments). Idea and images by Shannon Stewart formerly of Stetson School in Phoenix! To see photographs of Pulp Making and another idea —visit Play ough Category at the bottom of the page! Inside a small to medium glass vase Use beach sand, shells, small pieces of driftwood, the small discarded shell of a crab, etc., for a SEA SCENE. TIP: If working with a large group…put small glass vases on your wish list! I imagine that your parents have quite a few vases in their cupboards that they could donate–I get a couple every year with gifts of flowers. LOOKING FOR ‘SAND PLAY DOUGH’ RECIPES? Scroll down the page of the SAND THEME…there are five there!!! 1. Have children sort the colors. 2. Put the different colors into baggies and crush them till powdery. 3. Put individual layers in a baby food jar, or clear plastic or glass bottles… as you would colored sand. TIP: This is good for younger children without the hazard of sand…Older kids may also like as a novelty. Have children weave strips of fabric, ribbon or yarn on paper plates. Join the plates together to make the scales of a fish on a pre-made fish shape! Add strips of thinly cut roll paper or crepe paper to simulate sea weed! Cut out a few circles (bubbles) and space above fish’s head. Photograph of Display Wall by Lisa Tregellas at Display Photos. Pictured on the right is a close up of two woven plates. One (the white plate) is very easy to do with slits cut opposite each other on the edge of the plate. The children then simply wrap the yarn or ribbon up and down the front and back of the plate. Do this until all slits have yarn on them. Tie the yarn/ribbon in a knot in the back of the plate. The second way is a more traditional method of weaving paper. Fold the plate in half and cut a series of slits in the plate. Ribbon or yarn is then woven over and under (or in and out) the slits. The outer circle of this plate was painted before the weaving began. TIP: After doing the two plates with yarn—ribbon or slim strips of fabric would go more quickly. Need: 8 Seashells (available from the beach, or at craft supply stores); 1 plastic coffee-can lid; knitting yarn scraps; liquid white glue; sharp pencil or paper punch. 1. Glue each shell to the end of a short piece of yarn. Use liquid white glue. 3. Punch eight holes equally spaced on the top of a plastic coffee-can lid. Use a sharp pencil or a paper punch. 4. Hold the lid with the rim facing up. Push the eight pieces of yarn through the eight holes of the underside of the lid. 5. Tie the end of each piece of yarn in a large knot. Make the knot bigger than the hole so the yarn will not slip through. 6. Punch two more holes on opposite edges of the lid. 7. Push one end of a large piece of yarn from the top of the lid through one hole. It should come out on the underside of the chime. 8. Tie a large knot. 9. Push the other end of the yarn through the other hole and knot it. 10. Hang the chime on the branch of a tree or in your window. Color an underwater scene on the “eating” side of a paper plate. 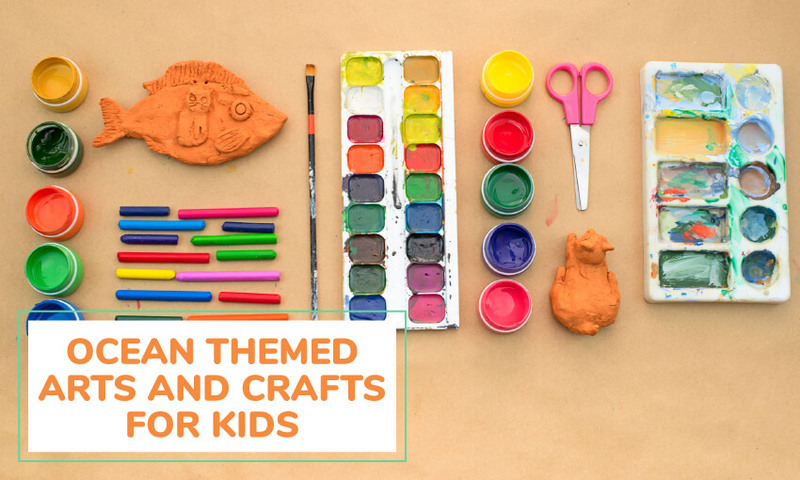 Glue goldfish crackers or cut-out pictures from coloring pages to the scene. Add a couple pieces of plastic plant or crepe paper for seaweed…and using glue…add a little sand or soft dirt to make the sea floor. Using a second paper plate, cut a circle in the middle. Cut a circle of blue plastic wrap 1 inch in diameter larger than your hole in the plate. On the “eating” side of this plate, glue the blue plastic wrap so that it covers and overlaps the hole on the plate. Glue or staple both plates together with “eating” side toward the inside. Punch a hole in the top and string a piece of yarn through the hole to hang your aquarium from the ceiling. Paint toilet paper tube. When dry cut eight slits halfway up. Add google eys. An Octopus! 1. Fill a large plastic soft drink bottle about one quarter full with water. 2. Add a few drops of blue food coloring and a very small drop of liquid detergent. 3. Pour in a small amount of clean sand or aquarium gravel. Blow up two small balloons, release most of the air, then tie the ends closed. Push the balloons into the bottle and screw the cap on tightly. When you have finished, you will have a fish tank with two bobbing “fish” inside. 4. The fish will swim in the water by holding the bottle sideways and rocking it back and forth. You may just discover that each child will want one of their own. Lay out pre-cut long pieces of string, twine, raffia, or fishing line, long-tube pasta, and plastic or fabric tropical flowers. The kids can string together the flowers and pasta to make a fun to wear lei necklace. 1. Cut out craft foam stars and use a sharpened pencil to poke a hole in the middle of each one. PUFFY WHITE PAINT…NOT ONLY FOR SNOW SCENES but great for clouds and the ocean! Measure equal parts white glue and shaving cream. Mix the two ingredients together. It should be very thick and fluffy. The object is for team members to wade in a small pool and try to recover marbles (clams) with their toes –and place them in their bucket. Rather than winners with each group, see which group can recover the most marbles. An alternative would be to float Frisbees on the water surface and have the kids place the marbles in the Frisbees. Each team will “go to the beach” in relay fashion carrying the lawn chair and the beach bag. This one is fun to watch. #1. Method: Once tagged the minnows (who are now sharks) also help run and tag the remaining players. The lead shark is always the caller. #2. Method: Once tagged the minnows sit down and become sea weed. The sea weed reaches out as the minnow run/swim by and if tagged–also sit and become sea weed. Get enough cushions (or pillows or squares of paper) so there is one per person. Play some background music. 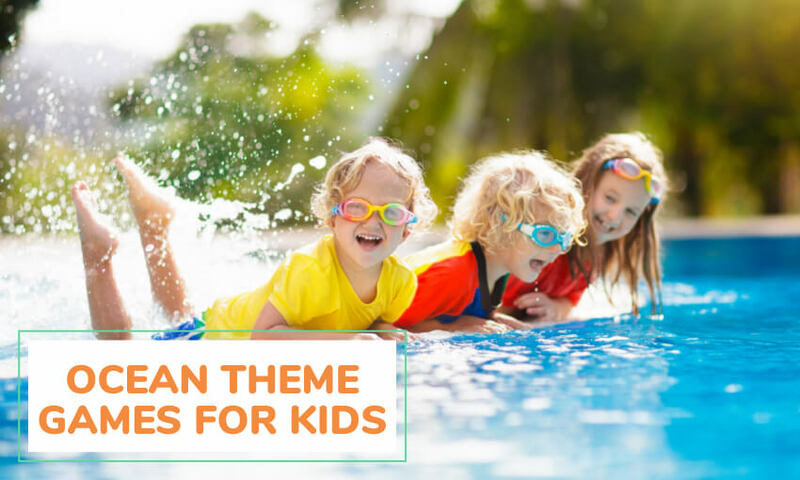 Tell the children that they are in the ocean and to start “swimming” around to the music. When you stop the music shout out “There’s a storm coming – dash to an island!” Everyone must jump onto a cushion so no part of their body is touching the ocean (the floor). Variation: Ask children to be fish–swimming in the sea. When you stop the music tell them there is a big shark coming to eat them. Dolphins, Boats, Crabs, Mermaids, mermen, etc. They could also be surfing! 25. HAVE A BEACH PARTY! Divide the children into two teams, on at each end of the play area. On your signal, the two teams run and try to jump the ropes. Keep on widening the ropes each time. They then get up and continue the jumps! A great classoom, party, or afterschool program idea! Place a basket ball hoop in a small child’s swimming pool. Fun! For each child, fill a small cup with goldfish crackers. Supply pretzel rods for fishing poles and peanut-butter to put on the ends to use as bait to snag the fish. Make or purchase large round sugar cookies. Cut large celery stalks in half. Fill each half with peanut butter, cream cheese or Nutella. Place a triangle shaped crackers in the center of each to simulate a sail. Open the bags of pretzels and place them on a parchment or waxed paper-lined cookie sheets in a single layer. DO ONLY ONE TYPE OF CANDY PER SHEET because the ‘Hugs’ melt faster than the kisses. Place cookie sheets in the preheated oven; bake 4 MINUTES FOR THE SHEET OF pretzels and HUGS—5-6 minutes for the pretzels and KISSES. Remove from oven and immediately place a gold fish on top of each pretzel/chocolate, pressing down gently. Put the variety of ingredients out in bowls.For some added fun–make small signs with the name of the “Ocean Themed” ingredient and place in from of each food choice. Draw or cut out pictures for children who can’t read! TIP from Snack Mix page: Let children know how much ‘measurement-wise’ they can take of offered foods; also how many choices they can have. Example: Each child can take 1/2 cup of 4 food choices offered. Refrigerate until the Jell-O begins to thicken. Add fish–they may need to be poked down a bit to suspend them ‘Under the Sea’ or Ocean. can be placed on the bottom to look like stones. 2. Add a few chocolate sprinkles or raisins to make ants; seal the bag. ANT HILL on the BEACH– Make edible ant hills in cups! 1. For the ‘sand” layer–first put vanilla or butterscotch pudding into the cup. Optional: After defrosting frozen spinach–drain and pat spinach (sea weed). Toss in with shells and butter. Following package directions–Boil shell macaroni until tender. Sprinkle on parmesan cheese. Can also sprinkle on parsley (more sea weed) for color. Simply create tree as in the image by KidActivities. Have extra ingredients to munch on! Example is adapted from Lori Eisner in Florida… Her last week of school is Caribbean/Ocean week. Children imagine they’re all on a CRUISE SHIP leaving from MIAMI, FLORIDA ON MONDAY and sailing to different islands. During the week limbo, hula,make fruit smoothies, try exotic fruits, read island books, and learn about the ocean. The last day of school is a luau. Kids could make/wear a white T-shirt that says, “Aloha ______ 2012” with a hibiscus drawn on the front and the autographs of children on the back. Have children create visors; girls wear hula skirts; boys wear Bermuda shorts. Create lei’s out of beads, foam flowers, and other materials. How Do YOU SAY_________ IN SPANISH? Make rainbow fish by coloring, painting, decorating and putting sequins on cut out fish shapes. What happens when salt dissolves in water? What happens to the standing salt water after a few days? Why? ANSWER…Salt dissolves in water. That does not mean that the salt disappears when this happens. The salt and water are mixed together in the solution. When the water evaporates, the salt is left behind. The sodium and chloride atoms rejoin with each other. WHAT IS THE DIFFERENCE BETWEEN A SEA AND OCEAN? According to the NOAA, There is only one global ocean. If you look at a map of the globe, it’s easy to see that there is really only one ocean. While there is only one global ocean, the seas are geographically divided into the Atlantic, Pacific, Indian, Arctic, and Southern (Antarctic) Oceans. These five oceans are not separate bodies of water; they form one continuous oceanic mass. The boundaries between these five oceans arose over time for a variety of historical, cultural, geographical, and scientific reasons. The Pacific, the Atlantic and the Indian Oceansare known as the three major oceans. The Southern Ocean is the ‘newest’ ocean. The boundaries of this ocean were set in 2000 by the International Hydrographic Organization.